Hadsell Stormer Richardson & Renick LLP is a leader both within California and nationally in the areas of employment, civil rights, and antitrust law. Several of our attorneys have been recognized by legal organizations as being the best in the field. Our partners at Hadsell Stormer Richardson & Renick LLP have argued employment cases before the Supreme Court of the United States, as well as the Court of Appeals and California Supreme Court. For nearly 30 years, the attorneys at Hadsell Stormer Keeny Richardson & Renick LLP have represented employees in cases involving employment, racial discrimination, sexual harassment, disability discrimination, hostile work environment, wrongful termination, wage and hour violations, and many other employment law violations. Our firm has also been on the cutting edge of wage and hour class action litigation for nearly a decade, fighting to ensure that employees and consumers are compensated for violations of the law. We have settled many multi-million dollar cases on behalf of employees denied minimum wage pay, meal and rest breaks, and overtime pay, as well as received multi-million dollar verdicts in trials on behalf of clients represented by our experienced attorneys. If you believe you have suffered a violation of the law by your employer, Hadsell Stormer Richardson & Renick LLP is here to fight tirelessly for you. Whether an employer is large or small, when employers violate federal or California employment laws, Hadsell Stormer Richardson & Renick LLP is there to fight for you. We have both the experience and the track record for obtaining justice for wronged employees. Hadsell Stormer Richardson & Renick LLP is also on the cutting edge of civil rights issues, litigating complex cases, sometimes creating new law. For example, we continue to prosecute cases against corporations for their violations of the law abroad, as well as to seek relief for detainees in Guantanamo Bay Prison. In all cases, Hadsell Stormer Richardson & Renick LLP demands that all clients are treated with fairness under the law. Because of our experience litigating cases involving sensitive issues of race, gender, disability, sexual orientation, among other subjects, our attorneys have the understanding and empathy to treat your individual situation with the seriousness and genuine caring it deserves. At the end of the day we work for our clients, and Hadsell Stormer Richardson & Renick LLP never sets that fact aside. If we accept your case, we will make every effort to ensure you are aware of the law as it applies to your case, the options available to you, and keep you informed every step of the way. At Hadsell Stormer Richardson & Renick LLP, we understand that legal matters can be daunting, frightening, confusing, and even frustrating at times. We constantly strive to be current with the ever changing parameters of the law and to sharpen the legal tools necessary to mitigate the sometimes overwhelming events which can occur during the course of litigating your case. 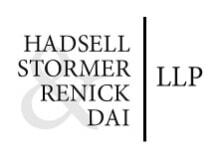 Hadsell Stormer Richardson & Renick LLP does not charge a fee for an initial consultation between you and one of our attorneys. We accept many cases on a contingency fee basis, meaning you pay no attorneys' fees until your case is resolved.